Okay, bestie. We’re going back to the basics today! 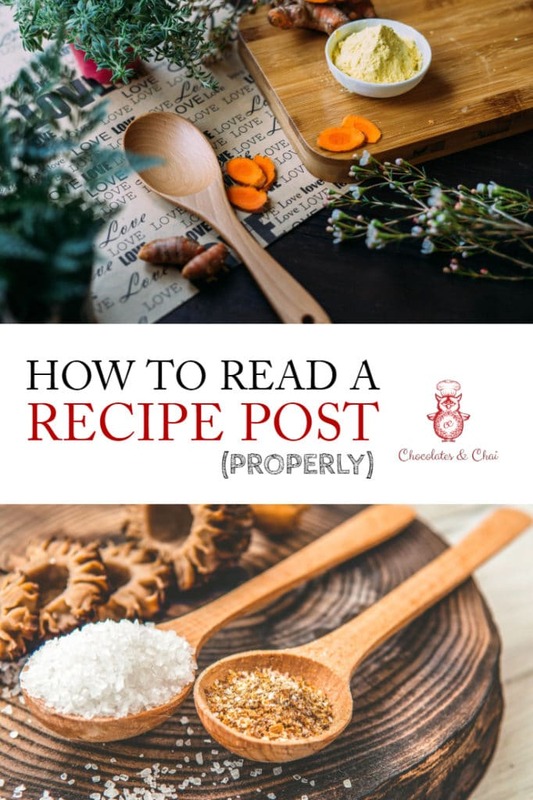 Well, technically we’re visiting this topic for the first time, I decided it’s important that I walk you through how to read a recipe post. I know, I know, it sounds obvious…and it is. But sometimes in the hustle, the bustle, and the excitement of creating something new, we can forget those old lessons that seem so obvious. Let’s call today’s post a reminder. Step 1) READ the entire recipe…twice, preferably. Did you ever do that exercise as a child where your teacher gives you a list of 20 things to do, and item number 20 is to ignore items 1 to 19? It’s kind of the same idea. Before you undertake a recipe, you need to know exactly what it is that you’re undertaking – this will not only tell you what ingredients and equipment is required, but it will familiarise you with the steps, technique, and time commitment that that recipe needs from you. (And I might get a little flack for this next part, I know there’s currently a backlash against bloggers who write long recipe posts.) You really should be reading through the post that accompanies the recipe too. Not only will it give you an idea of the narrative behind that recipe (because understanding the intentions and motivations behind a recipe really can change your approach to the execution), the accompanying post may have tips and tricks to make sure you get the best outcome using that recipe. My Fluffy, Fluffy Pancakes post is actually a pretty good example of this. When I was much younger and made my first batch of brownies, I used a coffee cup to measure out “1 cup”. Don’t be 8-year old me. Most North American blogs (including this one!) use standard US measuring cups. You should be aware that standard Australian, South African and Canadian cup measurements are slightly different. In most cases, as long as you’re using a standard size, you should be fine. The UK and Europe typically measure using weight and volume, this is certainly the most accurate method – which is why many baking recipes opt for this type of measurement. And this is generally pretty well known, but “1 1/2 cups” means “one and a half cups”, not “one half-cup”. Clear as mud? Awesome. Let’s splash on! Measuring spoons have standard sizes too! If a recipe doesn’t state “heaping”, you’ll need a nice level spoonful. A lot of basic cooking terms can sound fairly similar…how is slicing different from chopping? What’s the difference between stirring and whisking? These are a few basics you need to know when attempting recipes as they can impact your final product in a big way! If a recipe is using terms that feel completely foreign to you, then that may be a good indicator for you to take a little time to become familiar with the techniques referred to within the recipe before actually attempting it! For example, my Cheesy Oeufs en Cocotte recipe uses French words (like Oeufs, and Cocotte which just mean “eggs” and “pot” respectively), and cooking terms like bain-marie. Ideally, you’ll want to know what that means before attempting the recipe! And hey! If you would like me to write up a glossary-style post that explains common cooking terminology, let me know and I’ll see what I can do for you. The French term “mise en place” means “everything in its place”. And it’s a term you should take to heart. In practical terms, this means you should be measuring out, or chopping ingredients in an organised fashion. Most recipes assume some degree of mise en place when noting the Prep Time and Cook Time. 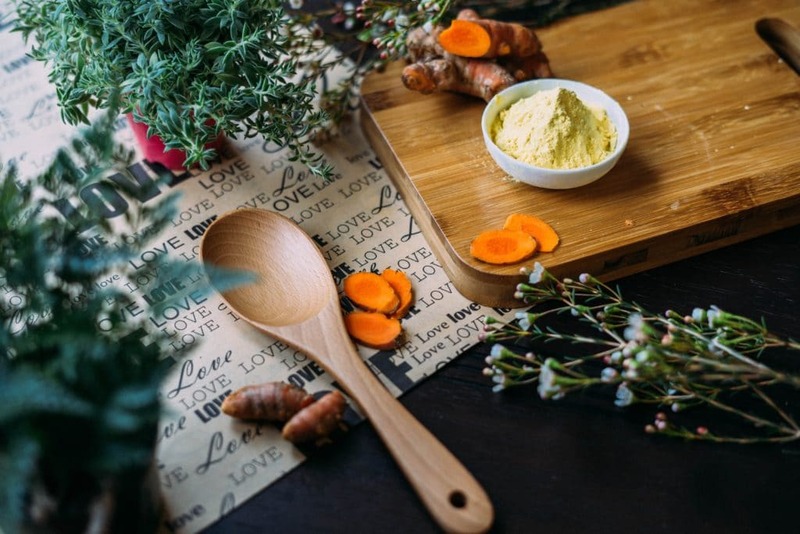 For example, a recipe may state “1 cup carrots, chopped coarsely” – the expectation here is that carrots will already be chopped when you start cooking, and that recipe’s prep time will not account for chopping carrots. Cooking (baking too) is one of those special activities where art and science work together to create something wonderful. The best chefs are often part-mad scientist, part-dreamy artist. While you don’t need to be either to read and follow a recipe post, it helps to understand why certain decisions have been made by the recipe developer. At the very least, trust the person who has written out the recipe for you. They’ve written it the way they’ve written it for a reason (likely, that was the way they found it works best). And if the recipe asks you to do something that doesn’t necessarily make sense to you straightaway (like, separating wet and dry ingredients when you’re going to mix them together later anyway), trust that there’s a reason for it. My Scrambled Eggs with Smoked Salmon recipe asks you to stir for 10-15 minutes. 10-15 minutes! For scrambled eggs. Yeah, there’s no way anyone would stand there doing that without a little faith in my instructions. And when in serious doubt, just ask Google. (I mean, you can ask me too…but you’ll probably get a reply from Google a little bit faster). Don’t do that. Or rather, you can. But get familiar with the recipe before you start getting fancy with it. If you’re trying something new, then modification should be something you plan for the future versions. It’s a completely natural occurrence, no two people like food cooked exactly the same. Once you’re comfortable reading and executing a recipe, then modify it to match your tastes. It sounds almost contradictory to what I was just saying, but you have to learn to cook to taste. 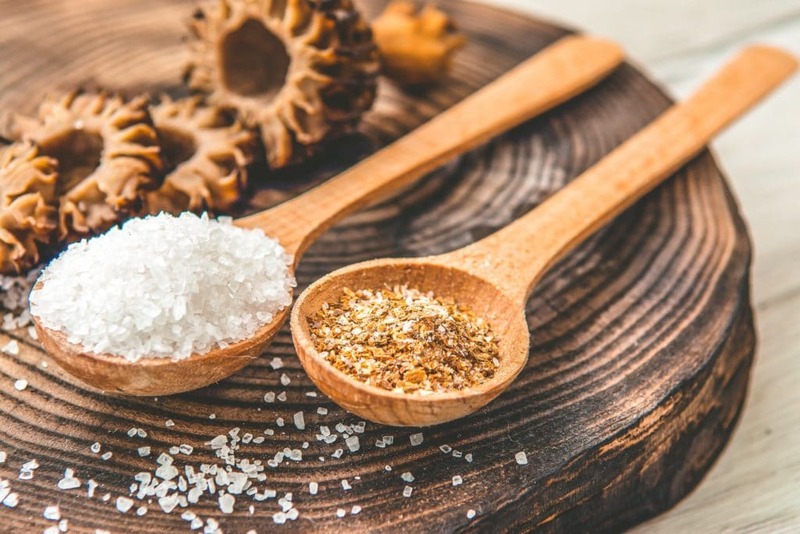 Not only is it a term that you’ll see in a lot of recipes (“Salt, to taste”), it’s the skill that will make sure the recipe always turns out great, for you. Personally, I always find myself saying that there’s something different about croissants made in France. And that makes perfect sense because the water there is different, the butter there is different, even the composition of the air there is different. Of course, the croissants taste a little different! There are also going to be differences in technique, ingredient quality, and equipment quality. And if you, like me, prefer your science as poetry, you can have a wonder about how particular hands can influence taste; whether flavour comes from love, or mood, or the history stored beneath one’s skin. If you’re the science-y type, consider this: how does the size, strength, motion and temperature of one’s hands impact cooking a recipe? So, in my long-winded way, that was me saying yes – once you’re familiar and comfortable with following a recipe as it is written, you should absolutely adapt it to your tastes. And learning how to read a recipe post properly is the one of the most important steps in being able to make those perfect meals. 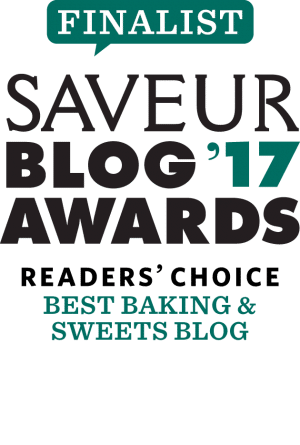 A lot of recipe posts stress the importance of using the very best ingredients (“Use the very best chocolate only!”), and there is truth to it. I’ve probably said it a bunch of times too. But don’t let it discourage you if the very best of something is not available to you – if you don’t have access to that super exclusive chocolate recommended in a recipe, use something similar (i.e. don’t replace dark chocolate with milk chocolate and expect a similar result), and something that is affordable and accessible to you. Lastly, don’t be too hard on yourself, bestie. If something doesn’t work out today, work at it, and tomorrow it’ll be better. The following are affiliate links. If you buy something through one of these links, I will receive a small commission. You won’t need to pay a penny more, but it’ll help keep my lights on! Thank you bestie, you smell great today! A good set of pans is crucial to cooking properly. I own this set on Nonstick pans from All-Clad, and would highly recommend you use something of at least a similar quality! Remember that part where we talked about making sure to use standard measurements (and not just a coffee mug)? Here’s a complete set of Measuring Cups and Measuring Spoons by Simply Gourmet – any kitchen without these is incomplete. 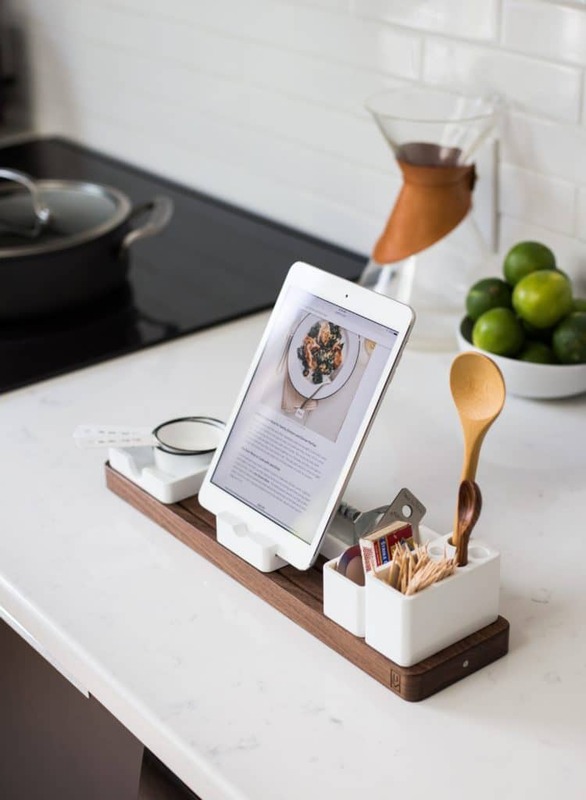 For more helpful tools, check out my Shop page – it’s got suggestions from kitchen essentials, to appliances, to my favourite cookbooks! Did I miss anything, bestie? Is there anything else you’d like to know? Let me know in the comments section below. And make sure to follow me on Facebook, Instagram, and Twitter to stay in touch. Or you can sign up for my mailing list to join The Besties Club, and have me email you directly. So exciting! Yes! Yes! Yes! For a novice like myself, sticking to measurements and using the exact ingredients are key or else…I’ll be eating the recipe alone while my family orders takeout. Happy Monday! I’m glad you found it useful! Precise kitchen scales are a great asset in the kitchen. There are some great substitutes (applesauce can substitute for an egg in cakes) others not so good(plain flour doesn’t work as a substitute for Self-raising flour, basmati rice won’t work in risotto). Google is your friend – if you know your metric system but not imperial, there are conversion calculators to convert volumes, for when you find THAT recipe but have no idea what an ounce is in grams. When you find THAT recipe on a blog or website, bookmark it AND print it. Keep practicing! When I left the family home, I couldn’t boil an egg. I taught myself to cook by using cookbooks. People are stunned when I tell them after I’ve fed them. I’ve been cooking for years but I loved this post! I love the way you write and provide examples for everything! I think a glossary would be useful. Thanks so much Kim! I think a glossary could be useful too (it’ll be handy for me too! )…I’ll start working on it! Let me know if there are any crucial terms you think should be included! Lots of great advice in this post, Riz! As a gluten-free blogger, I agree with your advice about not making substitutions unless you are intentionally altering a recipe. Different types of flours react in different ways and just can’t be substituted! Great post! Thanks Elaine! Yes, exactly! 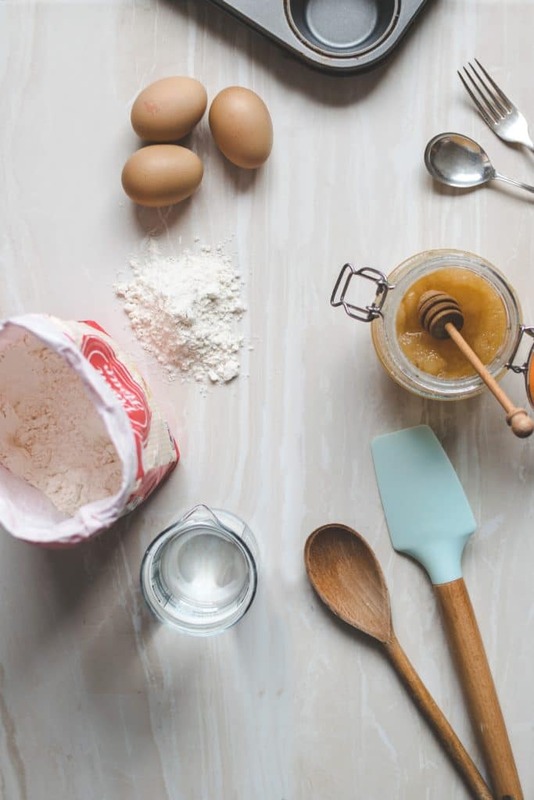 Though different types of flour may look alike they don’t always react in the same way, and it’s important to know the differences if one is planning to make any changes. Excellent, excellent post, Riz! Very good points covered in your post. As a recipe developer, one thing I get frustrated with is recipe plug-ins because I often cannot put in all of my learning tips and step by steps instructions without getting overly-verbose. 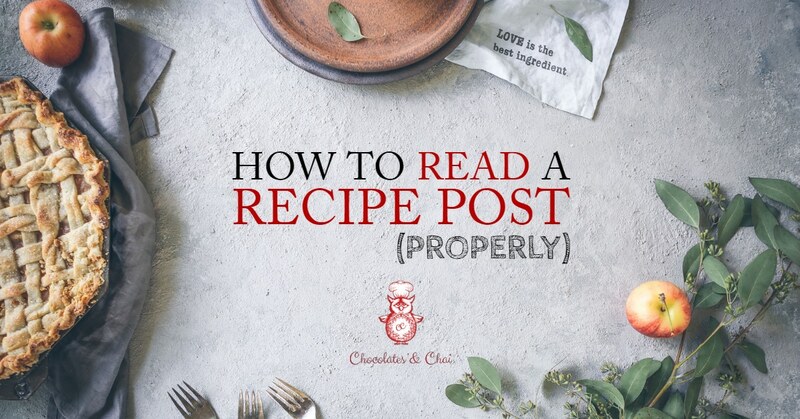 I love your suggestion about making sure to read the recipe post all of the way through – you can learn so much that way! Thanks for your dedication and commitment to your readers. So thorough, so awesome! You’re the best! I love your wit and humour here! All wonderful and sound advice for the novice cook. I have to say I’m more of a cup measurement gal and never quite got the hang of weight and volume! Thanks very much, Marisa! I’m glad you enjoyed the post! Although I grew up using weight and volume, I have to admit, the ease and simplicity of using cup measurements for everything is very appealing! Excellent post and points for those scrolling internet land in search of recipes! The most frustrating thing is when a reader makes your recipe incorrectly because they didn’t read through or understand the ingredients (they think white chocolate chips and white chocolate are interchangeable -ugh!) then they leave you a nasty comment and bad rating. And I can’t agree more about reading through the recipe in the beginning! That is the first thing I tell the kids when I’m teaching them to cook anything! Thanks for commenting Terri! I do know the frustration that comes with receiving negative comments or ratings…especially after someone has failed to read/understand your recipe! Unfortunately, I think it’s just some of the baggage we have to deal with as bloggers. I’m hoping that this post helps to minimise that sort of thing from happening! What a helpful post. I love your humor, the details about it. Thanks for sharing these great tips. Thanks so much for commenting, Amy! I’m glad you enjoyed the post! It might seem obvious but these are great reminders! Hi Melanie, thank you! I hope they’re helpful! This is some fantastic advice! I’ve shared it onto my Facebook page as it will be a great resource for those starting out or for those who need a reminder! Hey Vanessa! Thank you so much! Hopefully everyone finds it useful! Very well written! I am known to use what I have got on hand when following a recipe, but that comes from experience. Reading a recipe from start to finish will prevent headaches. I have definitely almost botched up a brioche since I didn’t read the whole recipe before starting but luckily time was on my side and I could fix it. Hey Cynthia! I’m very much the same, I often adapt recipes to use whatever is on hand. But you’re right, that’s a skill that comes with some experience! Thanks for commenting!